Now that you’ve completed the basic setup of the quote, you’re ready to add Milestones and Tasks to it. In this article we’ll discuss how to do so. To start with, you’ll need to add your first Milestone by clicking the Add Milestone button in the Milestones & Tasks metabox. You’ll now be presented with a modal window to enter information on the milestone. You should enter a Title, Start/End dates and the cost of this overall milestone. Once you’re done, Click Add Milestone and the Milestone will be added to the quote, ready to attach tasks to it. 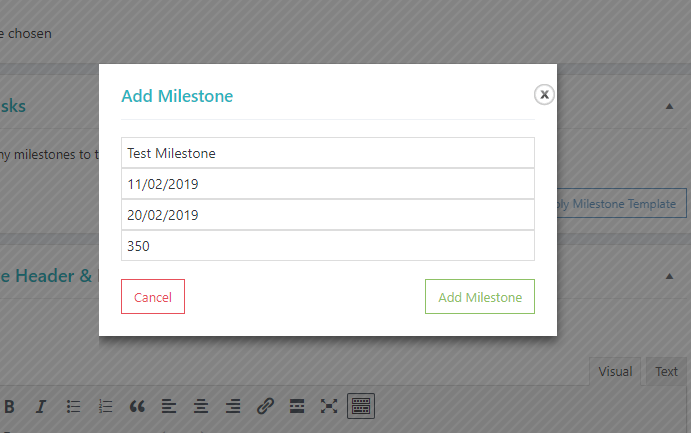 TIP: You can add as many milestones to a quote as you wish, and the milestones can be reordered by clicking and holding on the blue reorder button on each milestone. You can also edit and delete milestones by clicking the orange and red buttons. Note that deleting a milestone will also delete tasks that are attached to it. Now you have added your first milestone, you”re ready to attach tasks and subtasks to it. The process is similar to the ones used to add a milestone. To start with, click the green plus icon on the milestone that you want to add a task to. As before, you will be presented with a modal to insert information to the task. You should give the task a title, description, start / end dates and an estimate of time required to complete the task (optional). Once you’re done, click Add Task and the task will be attached to the milestone. 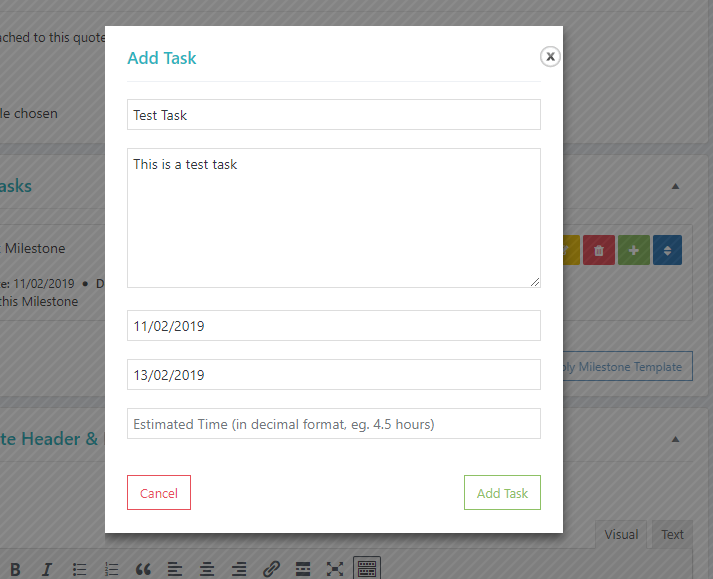 TIP: You can also add subtasks to the top-level tasks in the same way by clicking the green plus icon on the top-level task that you want to add the subtask to. You can also delete, edit and re-order tasks using the orange, red and blue buttons on each task.